IT TAKES chutzpah to tweet “rockets are tricky” shortly after one you have just launched has deliberately blown itself up. But Elon Musk, founder and boss of SpaceX, is not a man who lacks self-confidence, and he did just that on August 22nd after the terminal malfunction of one of his company’s Falcon 9 vehicles. That Arianespace, a French rival of SpaceX, announced on the same day that two satellites it had tried to launch to join the European Space Agency’s Galileo constellation (intended to rival America’s Global Positioning System), had entered a “non-nominal injection orbit”—in other words, gone wrong—shows just how difficult the commercialisation of space can be. If spacecraft are so precarious, then perhaps investors should lower their sights. But not in terms of innovation; rather in altitude. Airbus, a European aerospace company, thinks that developing satellite-like capabilities without satellites is the answer. Hence the firm’s recent trial, at an undisclosed location (but one subject to Brazilian airspace regulations) of Zephyr 7, a high-altitude “pseudo-satellite”, or HAPS for short. 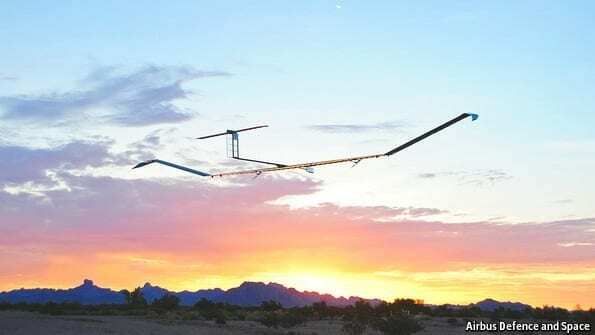 Zephyr (named after the Greek god of the west wind) is actually an unmanned, ultralight, solar-powered, propeller-driven aircraft. But it is designed, just as some satellites are, to hover indefinitely over the same part of the world. With a 23-metre wingspan and a weight of only 50kg, it is fragile and must remain above the ravages of the weather and the jet stream both by day and by night. It therefore flies at an altitude of around 21km (70,000 feet) during daylight hours, and then glides slowly down to around 15km when the sun is unavailable to keep it aloft.